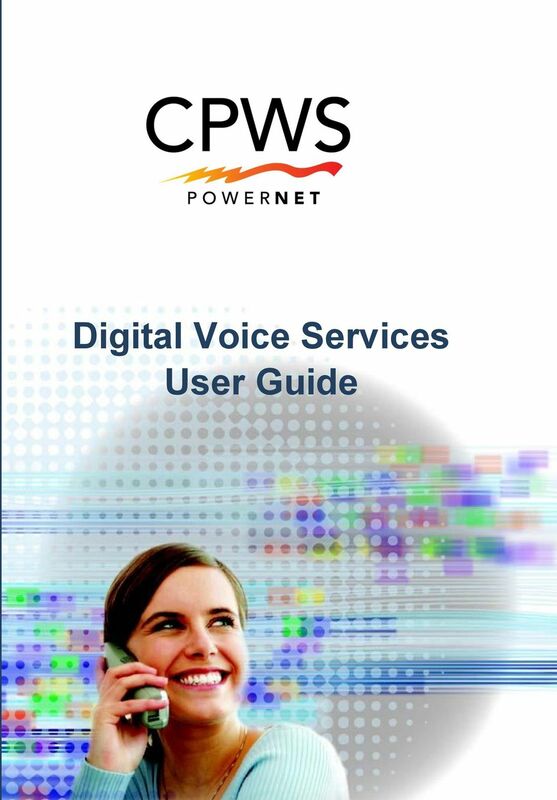 Download "Digital Voice Services User Guide"
5 5 P a g e General Information What is Digital Voice? 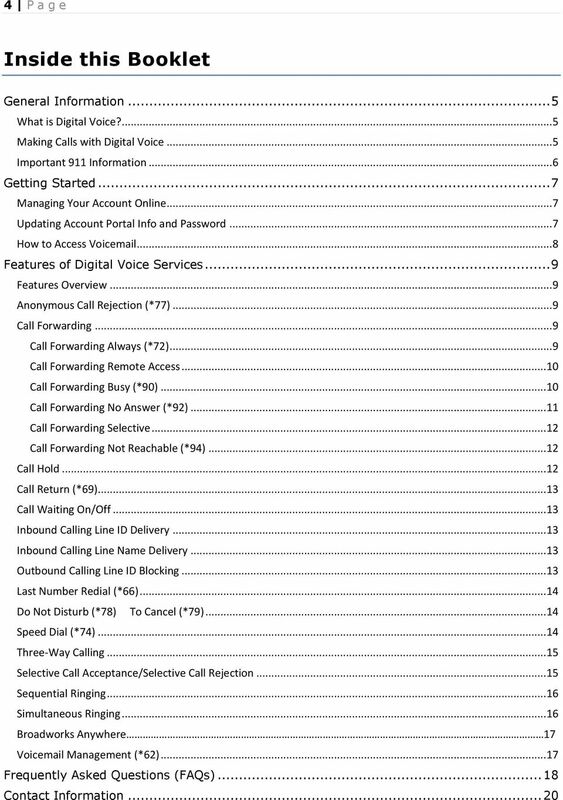 Digital Voice allows you to make and receive calls through your broadband Internet connection using a standard touch tone phone. Your Columbia Power & Water Systems Digital Voice service works with any touch tone, corded or cordless telephone. Our cable modem converts your phone calls into a data stream that is sent through your high-speed Internet connection. You can call anywhere at any time for less, and your phone number can go everywhere you do! Making Calls with Digital Voice You can make calls by dialing the number on your phone, as you always have. For calls within your area code, you may dial 7, 10 or 11 digits. 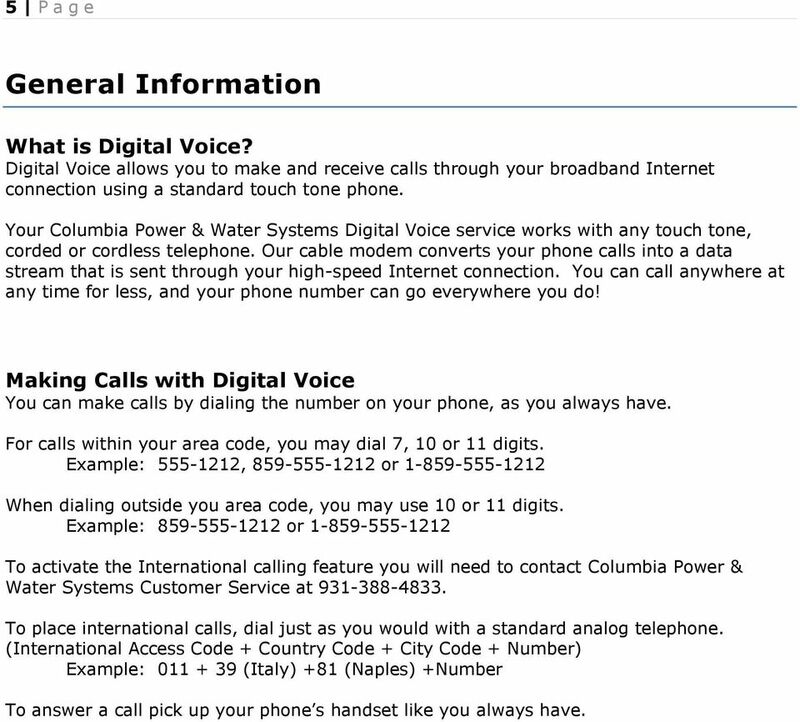 Example: , or When dialing outside you area code, you may use 10 or 11 digits. 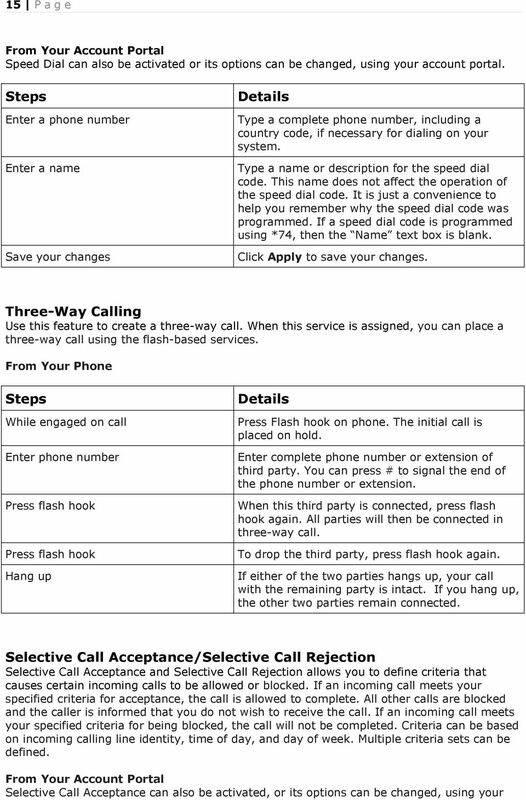 Example: or To activate the International calling feature you will need to contact Columbia Power & Water Systems Customer Service at To place international calls, dial just as you would with a standard analog telephone. (International Access Code + Country Code + City Code + Number) Example: (Italy) +81 (Naples) +Number To answer a call pick up your phone s handset like you always have. 7 7 P a g e Getting Started Managing Your Account Online Configure your Digital Voice account online. 1. Open your web browser and in the address bar type: 2. Your username is your 10 digit phone number. 3. Your temporary password should have been given to you when your service was activated. Click forgot password to generate a new password on the login screen. 4. Enter your phone number (username) and password into the appropriate fields and then click the Login button. 5. When you log in for the first time you will be prompted to create a four digit CPNI security code. This verifies your identity when requesting a change from our service department. Please keep this code in a safe place for future reference to make changes to your account. 6. On the Home page of the portal you will see a Features button which, when you click on it, will enable you to configure all of your features (e.g., Call Forwarding, Simultaneous Ringing, etc.). Updating Account Portal Info and Password 1. Click on the Account Info button to update account, personal, service address, or billing address information. When you are done, click the Update button to save your changes. 2. To change your password, click on the Change Password tab and follow the directions. The password length must be at least 6 characters. The password must contain at least 1 number, at least 1 lower case letter, and at least 1 upper case letter. The password should not consist of any personally identifiable information, or easily guessed words or digits. 3. Enter your old password, enter your new password, confirm your new password, and then click verify. 4. 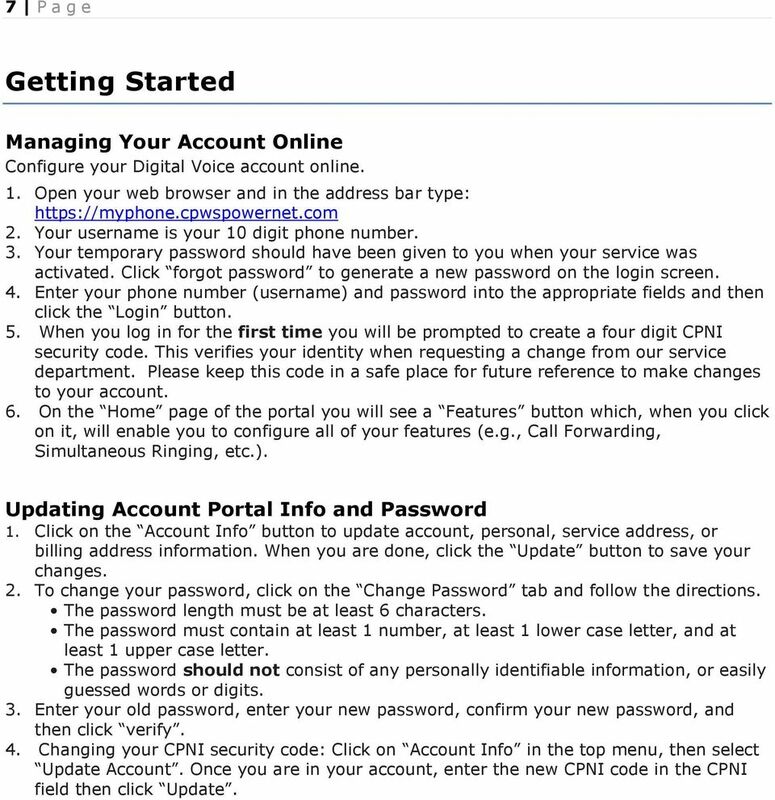 Changing your CPNI security code: Click on Account Info in the top menu, then select Update Account. Once you are in your account, enter the new CPNI code in the CPNI field then click Update. 10 10 P a g e Forwarding include Call Forwarding No Answer and Call Forwarding Busy. Unlike those services, Call Forwarding Always redirects all of your calls, not just those received when you do not answer or when you are talking on your phone. From Your Phone Call Forwarding Always can be activated, and its options changed, using your phone. To do this dial * 72, followed by the phone number to which you wish your calls to be redirected. Your calls remain forwarded until you dial the deactivation code (*73). Call Forwarding Always can also be activated, or its options changed, using your Account Portal. 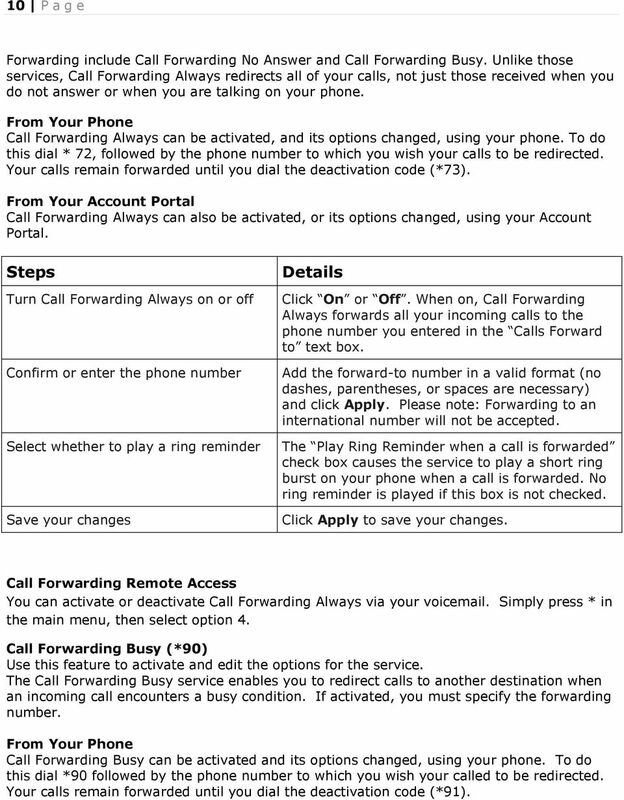 Turn Call Forwarding Always on or off Confirm or enter the phone number Select whether to play a ring reminder Save your changes Click On or Off. When on, Call Forwarding Always forwards all your incoming calls to the phone number you entered in the Calls Forward to text box. Add the forward-to number in a valid format (no dashes, parentheses, or spaces are necessary) and click Apply. Please note: Forwarding to an international number will not be accepted. The Play Ring Reminder when a call is forwarded check box causes the service to play a short ring burst on your phone when a call is forwarded. 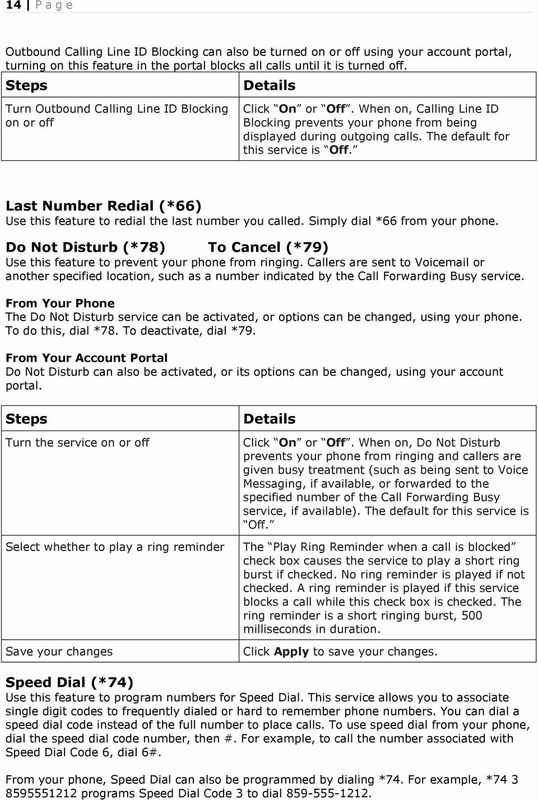 No ring reminder is played if this box is not checked. Click Apply to save your changes. 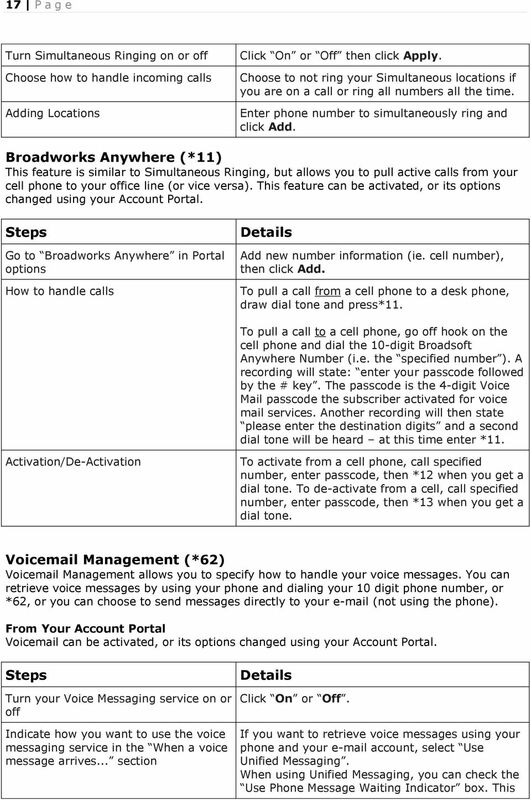 Call Forwarding Remote Access You can activate or deactivate Call Forwarding Always via your voic . Simply press * in the main menu, then select option 4. 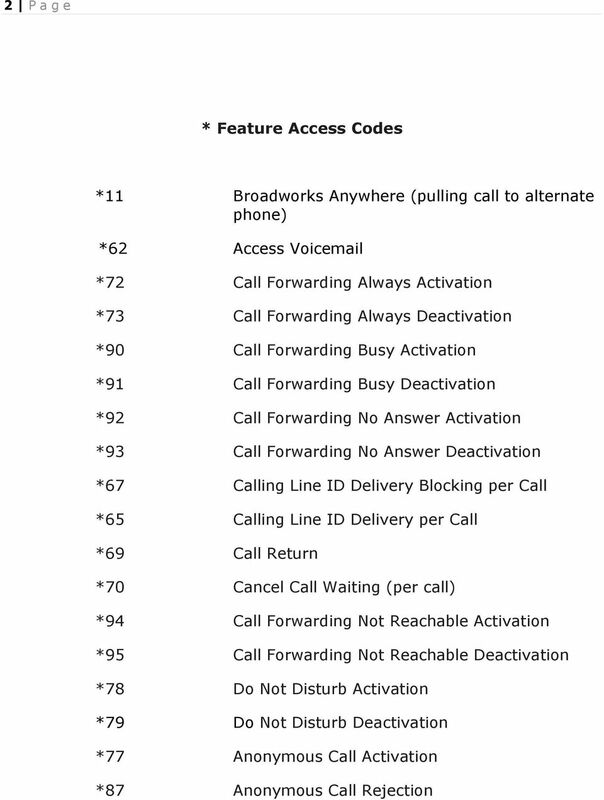 Call Forwarding Busy (*90) Use this feature to activate and edit the options for the service. The Call Forwarding Busy service enables you to redirect calls to another destination when an incoming call encounters a busy condition. If activated, you must specify the forwarding number. From Your Phone Call Forwarding Busy can be activated and its options changed, using your phone. To do this dial *90 followed by the phone number to which you wish your called to be redirected. Your calls remain forwarded until you dial the deactivation code (*91). 11 11 P a g e Call Forwarding Busy can also be activated, or its options changed, using your Account Portal. 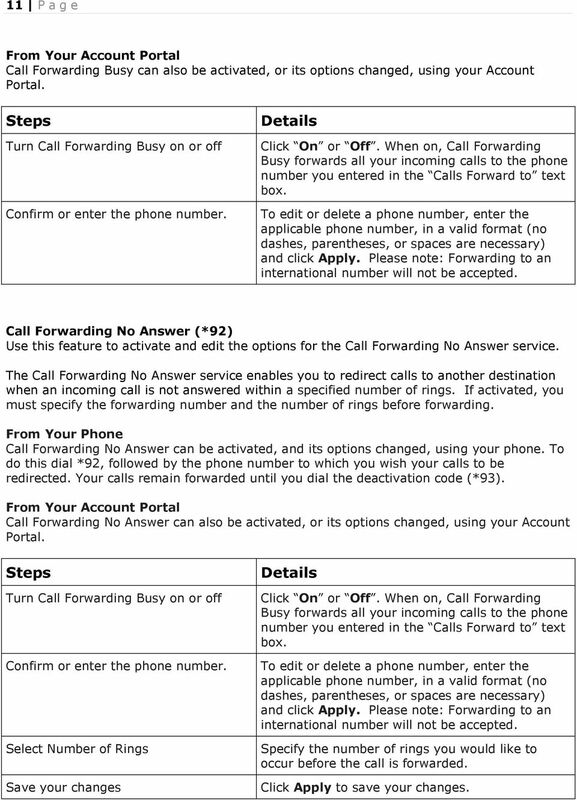 Turn Call Forwarding Busy on or off Confirm or enter the phone number. Click On or Off. When on, Call Forwarding Busy forwards all your incoming calls to the phone number you entered in the Calls Forward to text box. To edit or delete a phone number, enter the applicable phone number, in a valid format (no dashes, parentheses, or spaces are necessary) and click Apply. Please note: Forwarding to an international number will not be accepted. Call Forwarding No Answer (*92) Use this feature to activate and edit the options for the Call Forwarding No Answer service. The Call Forwarding No Answer service enables you to redirect calls to another destination when an incoming call is not answered within a specified number of rings. If activated, you must specify the forwarding number and the number of rings before forwarding. From Your Phone Call Forwarding No Answer can be activated, and its options changed, using your phone. To do this dial *92, followed by the phone number to which you wish your calls to be redirected. Your calls remain forwarded until you dial the deactivation code (*93). Call Forwarding No Answer can also be activated, or its options changed, using your Account Portal. Turn Call Forwarding Busy on or off Confirm or enter the phone number. Select Number of Rings Save your changes Click On or Off. When on, Call Forwarding Busy forwards all your incoming calls to the phone number you entered in the Calls Forward to text box. To edit or delete a phone number, enter the applicable phone number, in a valid format (no dashes, parentheses, or spaces are necessary) and click Apply. Please note: Forwarding to an international number will not be accepted. Specify the number of rings you would like to occur before the call is forwarded. Click Apply to save your changes. 13 13 P a g e remove the call from hold. Call Return (*69) Use this feature to call the last party who called your number, whether or not the call was answered. From Your Phone Call Return can be accessed using your phone. Simply dial *69. If you wish to hear an audio playback of the number of the last caller, press *69 then option 1 when prompted. 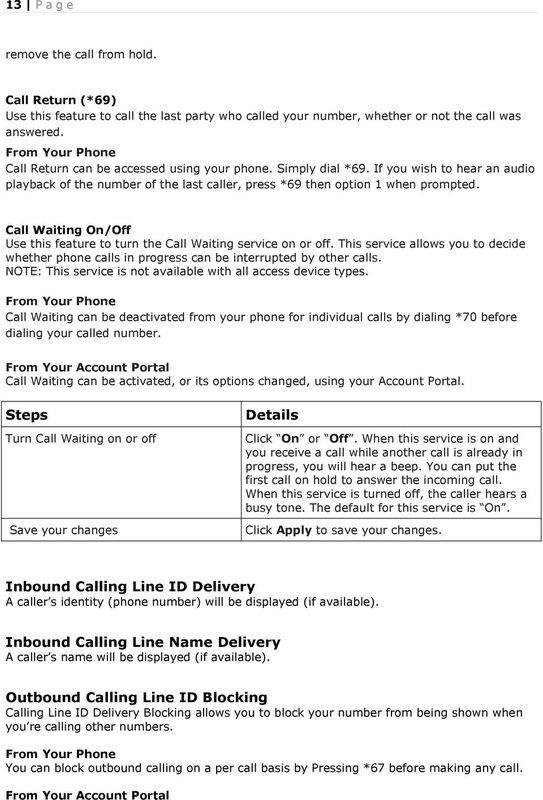 Call Waiting On/Off Use this feature to turn the Call Waiting service on or off. 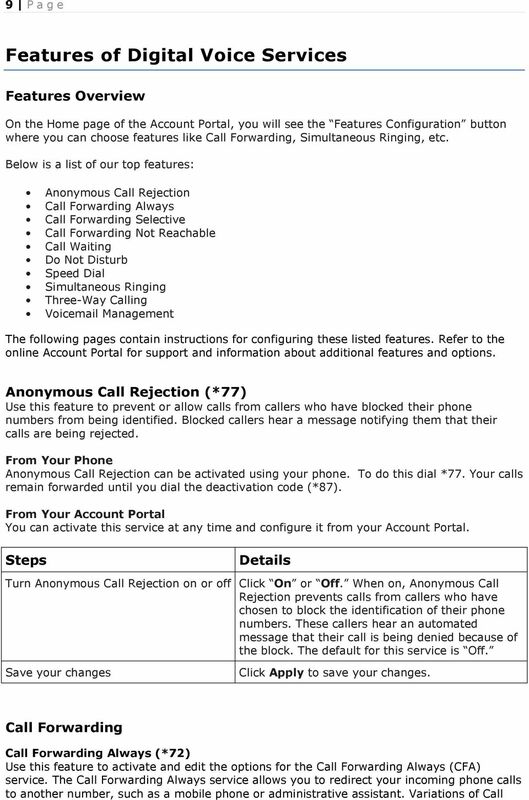 This service allows you to decide whether phone calls in progress can be interrupted by other calls. NOTE: This service is not available with all access device types. From Your Phone Call Waiting can be deactivated from your phone for individual calls by dialing *70 before dialing your called number. 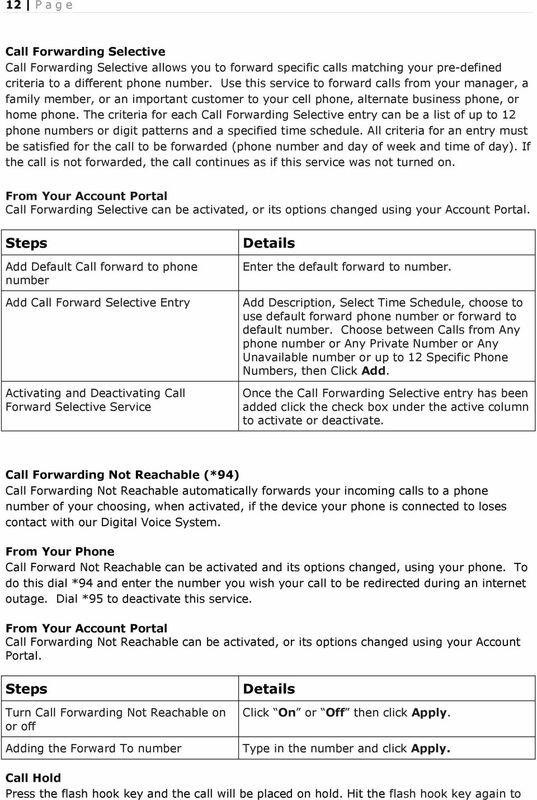 Call Waiting can be activated, or its options changed, using your Account Portal. Turn Call Waiting on or off Save your changes Click On or Off. When this service is on and you receive a call while another call is already in progress, you will hear a beep. You can put the first call on hold to answer the incoming call. When this service is turned off, the caller hears a busy tone. The default for this service is On. Click Apply to save your changes. Inbound Calling Line ID Delivery A caller s identity (phone number) will be displayed (if available). Inbound Calling Line Name Delivery A caller s name will be displayed (if available). Outbound Calling Line ID Blocking Calling Line ID Delivery Blocking allows you to block your number from being shown when you re calling other numbers. From Your Phone You can block outbound calling on a per call basis by Pressing *67 before making any call. 16 16 P a g e account portal. Add Selective Call Acceptance or Rejection Entry Add Description and select Time Schedule. Choose between Calls from Any phone number or Any Private Number or Any Unavailable number or up to 12 Specific Phone Numbers, then Click Add. 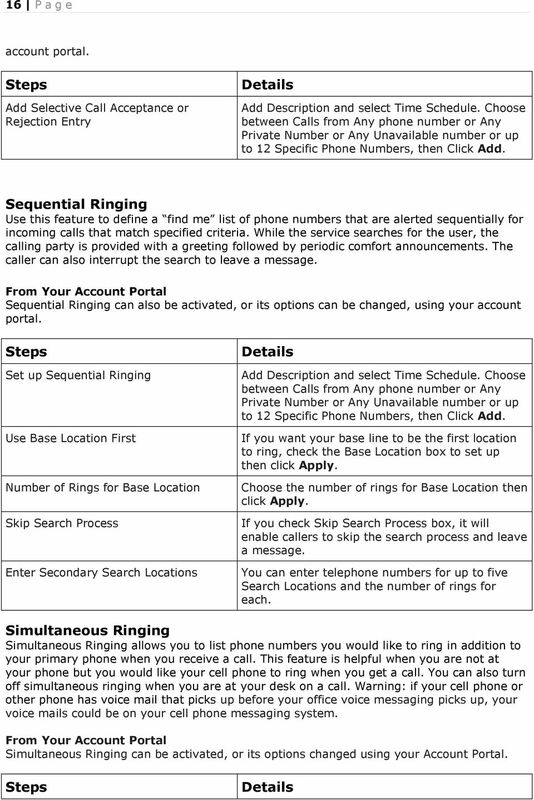 Sequential Ringing Use this feature to define a find me list of phone numbers that are alerted sequentially for incoming calls that match specified criteria. While the service searches for the user, the calling party is provided with a greeting followed by periodic comfort announcements. The caller can also interrupt the search to leave a message. Sequential Ringing can also be activated, or its options can be changed, using your account portal. Set up Sequential Ringing Use Base Location First Number of Rings for Base Location Skip Search Process Enter Secondary Search Locations Add Description and select Time Schedule. Choose between Calls from Any phone number or Any Private Number or Any Unavailable number or up to 12 Specific Phone Numbers, then Click Add. If you want your base line to be the first location to ring, check the Base Location box to set up then click Apply. Choose the number of rings for Base Location then click Apply. If you check Skip Search Process box, it will enable callers to skip the search process and leave a message. You can enter telephone numbers for up to five Search Locations and the number of rings for each. Simultaneous Ringing Simultaneous Ringing allows you to list phone numbers you would like to ring in addition to your primary phone when you receive a call. This feature is helpful when you are not at your phone but you would like your cell phone to ring when you get a call. You can also turn off simultaneous ringing when you are at your desk on a call. Warning: if your cell phone or other phone has voice mail that picks up before your office voice messaging picks up, your voice mails could be on your cell phone messaging system. Simultaneous Ringing can be activated, or its options changed using your Account Portal. 18 18 P a g e option provides a stuttered dial tone (and blinking light on some phones) to inform you when you have messages waiting. If you always listen to your voice messages using your account and do not use the phone retrieval option, select Forward it to this address: and provide the address where you want your voice messages to be sent. Indicate whether you want to be notified by of new messages Indicate if you want a carbon copy of your messages Indicate whether callers have the option to transfer to another number instead of leaving a voice message Save your changes If a check mark appears in the Notify me by e- mail of the new voice message at this address: box, a short message informing you about the new caller and date/time of the message is sent. In the text box, type the address where you want these notifications to be sent. If you want a carbon copy of your messages to be sent to another address, check the a carbon copy of the voice message to: box and provide the address where you want the copy to be sent. If a check mark appears in the Transfer on 0 to Phone Number: box, callers can press 0 during your outgoing voice message and be transferred to another number, such as a mobile phone or auto attendant. If a caller presses 0 while recording a message, the recording is aborted, no message is left and the caller is transferred. Click Apply to save your changes. Frequently Asked Questions (FAQs) Do I need to have my computer turned on when I talk on the phone? 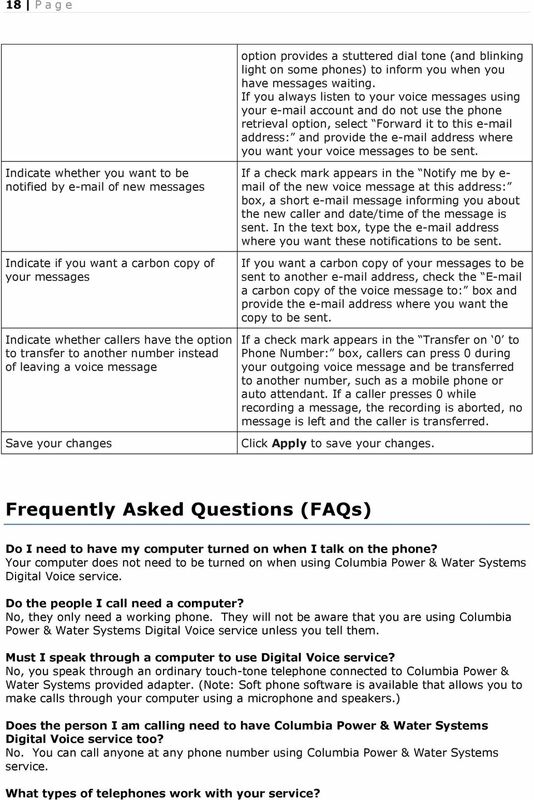 Your computer does not need to be turned on when using Columbia Power & Water Systems Digital Voice service. Do the people I call need a computer? No, they only need a working phone. 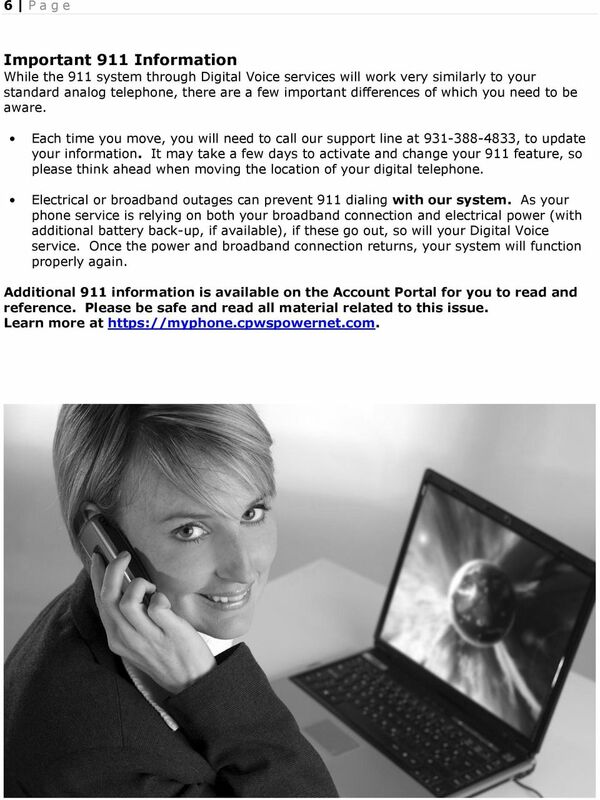 They will not be aware that you are using Columbia Power & Water Systems Digital Voice service unless you tell them. 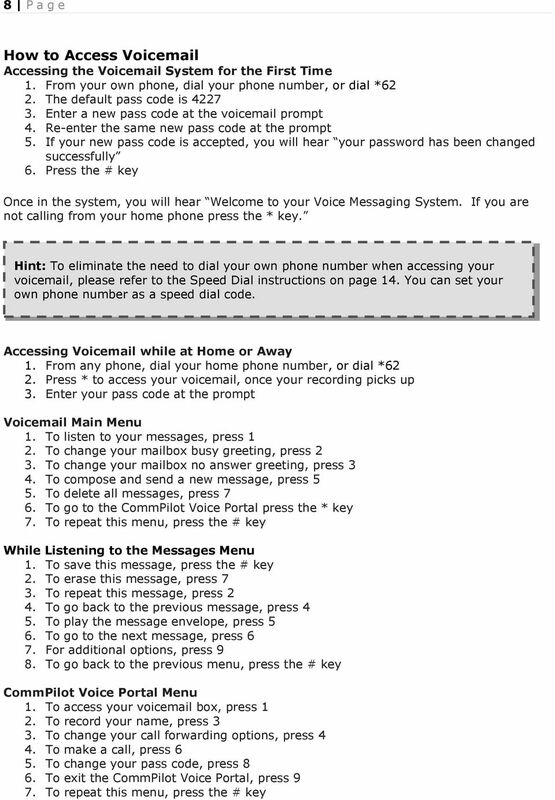 Must I speak through a computer to use Digital Voice service? No, you speak through an ordinary touch-tone telephone connected to Columbia Power & Water Systems provided adapter. (Note: Soft phone software is available that allows you to make calls through your computer using a microphone and speakers.) 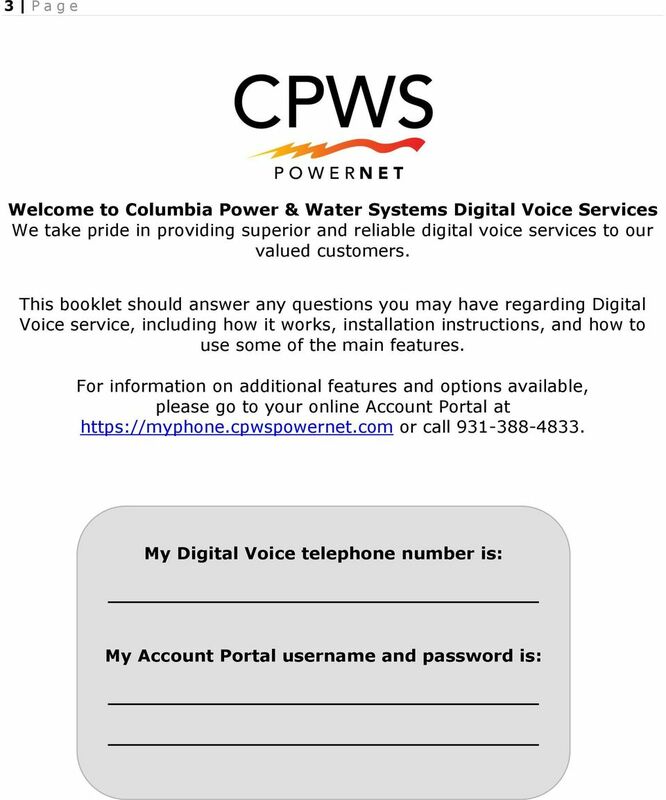 Does the person I am calling need to have Columbia Power & Water Systems Digital Voice service too? No. You can call anyone at any phone number using Columbia Power & Water Systems service. What types of telephones work with your service? 19 19 P a g e Any touch tone telephone can be used with Columbia Power & Water Systems Digital Voice service. Corded and cordless telephones both work well. Can I use a fax machine with Columbia Power & Water Systems service? Columbia Power & Water Systems customers have experienced high success in placing and receiving fax transmissions, however Columbia Power & Water Systems Digital Voice service has not yet certified support for fax usage. Can I still use the Internet while making calls? Yes. Your computer and Columbia Power & Water Systems Digital Voice service can share an Internet connection. Can I use Columbia Power & Water Systems Digital Voice service with my home alarm system or personal emergency response services company? You may connect any telephone communication device to your Columbia Power & Water Systems Digital Voice service adaptor. We recommend keeping a traditional phone line for home or personal emergency response devices. The service depends upon your broadband Internet connection and electrical power. If your Internet connection or power is not available, you will not be able to make or receive calls, nor will your alarm system. Please consult with a qualified alarm system technician before connecting your alarm system to a Columbia Power & Water Systems Digital Voice line. 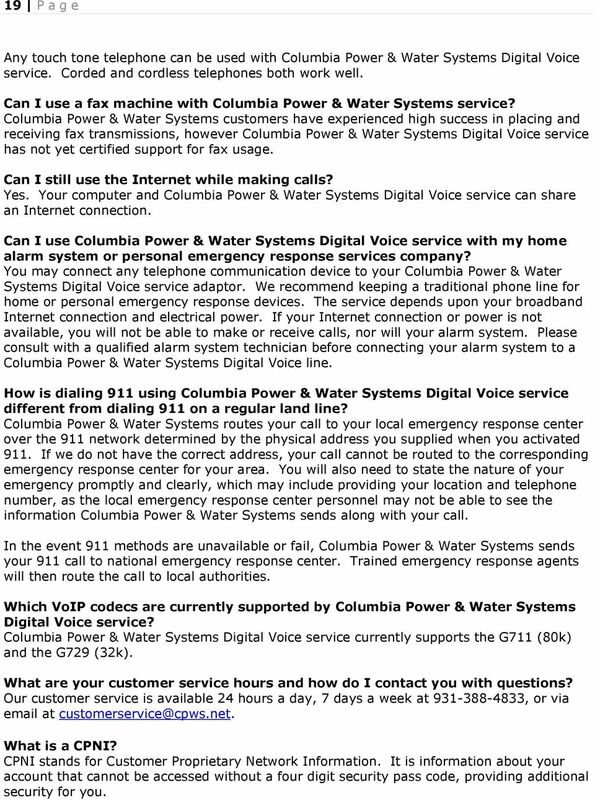 How is dialing 911 using Columbia Power & Water Systems Digital Voice service different from dialing 911 on a regular land line? Columbia Power & Water Systems routes your call to your local emergency response center over the 911 network determined by the physical address you supplied when you activated 911. If we do not have the correct address, your call cannot be routed to the corresponding emergency response center for your area. You will also need to state the nature of your emergency promptly and clearly, which may include providing your location and telephone number, as the local emergency response center personnel may not be able to see the information Columbia Power & Water Systems sends along with your call. In the event 911 methods are unavailable or fail, Columbia Power & Water Systems sends your 911 call to national emergency response center. Trained emergency response agents will then route the call to local authorities. Which VoIP codecs are currently supported by Columbia Power & Water Systems Digital Voice service? Columbia Power & Water Systems Digital Voice service currently supports the G711 (80k) and the G729 (32k). What are your customer service hours and how do I contact you with questions? 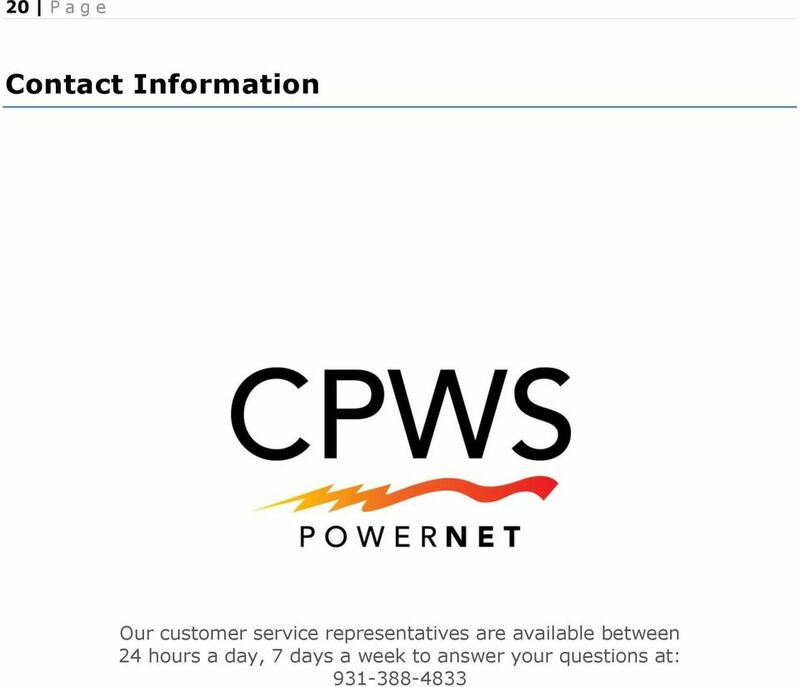 Our customer service is available 24 hours a day, 7 days a week at , or via at What is a CPNI? CPNI stands for Customer Proprietary Network Information. It is information about your account that cannot be accessed without a four digit security pass code, providing additional security for you.